SQL SERVER 2012 – Fix – Error – 5591 – FILESTREAM feature is disabled. Recently, I was working on semantic search and tried to create a database having filestream and got an error FILESTREAM feature is disabled. After some research, I found the solution. Error Message: FILESTREAM feature is disabled. Ooopps…… I am unable to create a database having FILESTREAM. So what is the solution ? Once you click on SQL Server configuration manager, it will open SQL Server configuration manager options. It has two panes. Now you need to select SQL Server Services from the left hand pane and select the SQL Server Instance on which you need to enable the FILESTREAM. Just right click on it and select PROPERTIES as shown in the image below. 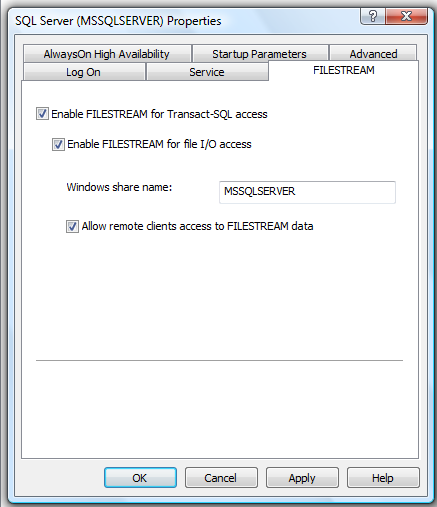 Enable FILESTREAM for Transact-SQL access (You need to enable this to enable FILESTREAM). And Click APPLY button as shown in the picture below. Once you are done with SQL Server Configuration Manager, open SQL Server Management Studio and open a new query window. Now, you are in the new query window, just execute the given below script. 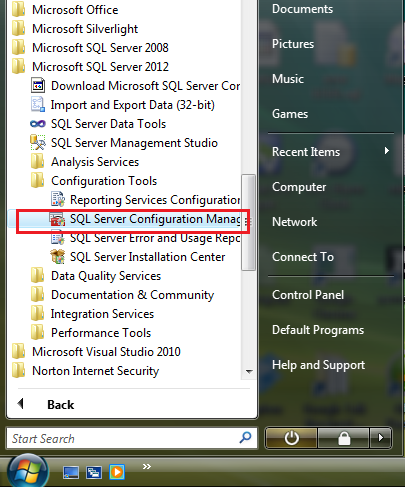 And after that DO NOT forget to restart the SQL Server SERVICE. FILESTREAM is enabled now. You can execute any script having FILESTREAM. It will be executed successfully.